I have 2 children (ages 4 and 7). They’re very active and we’re always on the go. We’ve never had a problem with them not wanting to get out and play or hang out as a family, but meal times are a real challenge. I work very hard to serve healthy meals for my family, but I just can’t get them to eat the healthy stuff. They’d be totally satisfied with pizza and grilled cheese sandwiches every day, but I think that would be irresponsible. My friends say that as long as they’re eating, I shouldn’t worry. I just don’t see it that way. I’m afraid if I only let them eat those “fun” foods, I’m enabling a poor lifestyle choice that will have a negative effect on them for the rest of their lives. Am I being ridiculous? You’re not being ridiculous at all. Wanting the best for your kids is a completely normal part of motherhood. 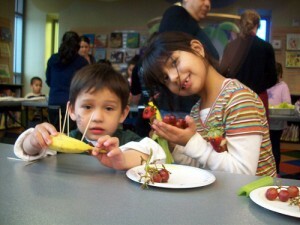 As for getting them to eat things that are more nourishing for their growing bodies, there are few things you can do. Dress up the food: Rather than sticking to plain steamed veggies and grilled chicken in neat sections on their plates, try making the food look more fun. Arrange the food so that it appears to be a picture. For example, the grilled chicken could be a “rocket,” the mashed potatoes could be puffs of smoke coming out the bottom of the rocket and the mixed veggies could be starts and planets. With a little creativity, you can make all sorts of delicious food art like animals, people or landscapes.You can even use toothpicks to make 3D sculptures. The added bonus is, your artwork can be a conversation starter, too. Serve the fun stuff as a reward: Set up guidelines for what your kids should eat every day (like something from each food group). Make a chart for them. If they eat all the good things for a certain percentage of the time (nobody is perfect), then on Saturday, they can have homemade pizza with natural, healthy ingredients. It’s important to set the bar somewhat high, like (80% of the time), but not to flip out if they don’t meat the goal. Let the reward, or lack thereof, be the driving force behind the program. If one doesn’t meat the goal and misses out while the other is enjoying some delicious pizza, an impression will be made. Don’t concentrate on the food, go for color: I’m going to be completely honest. I LOATHE peas. The taste of them literally makes me gag. When my dad used to make me eat them, I would cry. I did however like spinach, salads and green beans. If I’d been given some options, things probably would have gone down a whole lot more smooth. Tell your kids they have to eat three different colors. This may sound silly, but it’s amazing how much brown and tan food we eat. If they are having a variety of colors, they are getting a variety of nutrients. Ask questions: This is a step we have a tendency to forget, myself TOTALLY included. Ask them what exactly they don’t like about the food. When I was little, I hated the consistency of cooked carrots, but LOVED them raw. Their aversion may be as simple as something like that. Maybe they don’t like red meat, but love white meat. Ask them what they don’t like about certain foods and see if you can find a compromise that will make everyone happy and healthy. I think the advice given is great but I disagree with using junk food as a reward if they eat the good stuff. I think that puts the foot on a pedestal it doesn’t deserve as it is damaging and bad for the body. However I do like that HOMEMADE was mentioned because this way you have control over what you are indulging your child in and it will be healthy in comparison to store bought stuff. Many people I know have found it easier if they make everything from scratch at home, have lots of fresh fruit and vegetables available with dips like houmous at home. This way at home their children pick these foods. Then if they go out and their child wants something “junky” its not so uch a big deal because it isn’t something found at home.